[By Nick, New for Feb 2016] In the past few years, companies have started to embraced the anti-valentine's day/singles awareness day. The latest to jump on the bandwagon is Dairy Queen with their latest limited edition blizzard. 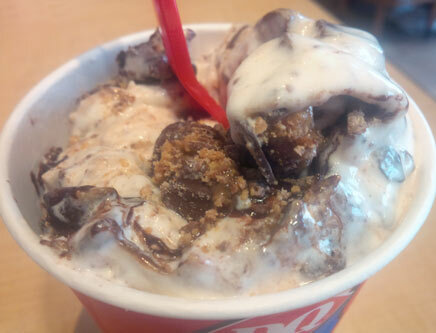 Actually, I forgot to mention, a new DQ just opened up in my area and this was my first time checking it out. It amazes me that we didn't have a DQ here sooner but that's neither here nor there. This blizzard is a product of the fact that singles outweigh married couples or something among those lines. Either way, this blizzard sounds pretty epic and a non single person such as myself is able to enjoy it as well. Okay, this one looks as good as it sounds and tastes just as good. The combination of sweet and salty is sheer perfection here. The peanut butter cups on their own have the right balance. The combination of the truffles and soft serve work to also reach that perfect balance between the two. I was a bit worried just how the truffles and peanut butter cups would work together but that was all for nothing. I feel like reeses needs to come out with a pb cup featuring a salted caramel layer at this point. The truffles makes things a bit more salty but not overwhelmingly so. The peanut butter topping doesn't play a role that I can tell. I'm not sure if it was even added to my blizzard to be honest. If it wasn't, I don't think it would be needed. Though I have limited blizzard experience, this one has by far become my favorite. 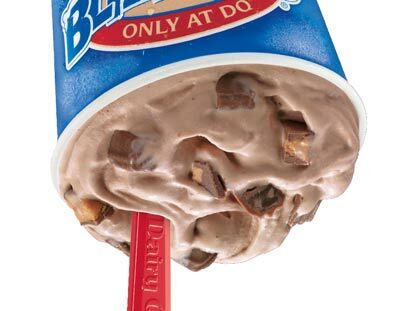 I'm excited that I know have a DQ near me so I can finally get my hands on some of these babies. I assumed singles meant that it was a smaller size but I guess not...ha. It does sound like an odd combo as I don't typically associate pb with caramel but I can see how it would work as the Reese's pb has a salty kick to it. Why were you concerned about the combination of caramel and peanut butter? They go extremely well together. Take 5, Whatchamacallit, Peanut Butter snickers, and Reese's Nutrageous all feature a combination of caramel and peanut butter and they all work. It's not a unique combination by any means. True! Remember the old PB Max bar? That was so good. I tried this blizzard last week at a chill and grill in Virginia. We got the $5 lunch (one of the best deals out there imo) and I upgraded to this blizzard. I loved it! I wish they would make it permanent! That's funny...there are so many peanut caramel combos after all! Deb & Stride: I meant salted caramel and peanut butter. Caramel is sweet on its own and works with the saltiness of peanut butter. Adding the salty component from the salted caramel with the peanut butter made me think it would be a bit too salty.